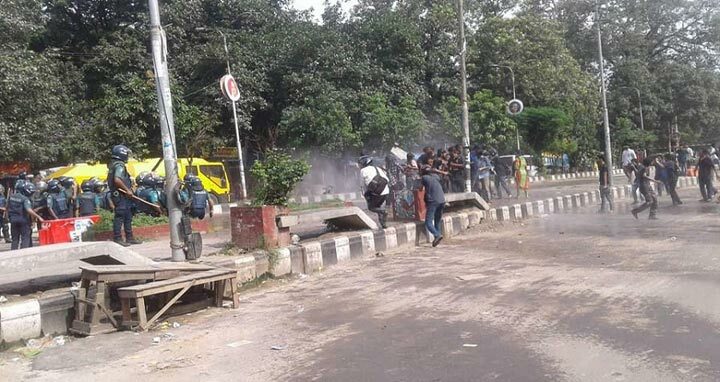 Dhaka, 6 August, Abnews: Police and university students clashed at Shahbagh intersection in the capital while they were taking preparations for a demonstration demanding safe roads. The incident took place around 3:15pm on Monday. During this time, the protesting students threw brickbats targeting police. In retaliation, police lobbed tear shells towards the students. Maruf Hossain Sardar, deputy commissioner of DMP (Ramna division), confirmed this to media. Several students have been detained in this connection, he said.